Proper care of the face is unimaginable without a good quality peeling whose main role in addition to cleaning the skin from dirt is to remove dead cells that have accumulated on it. Natural peelings can easily me made at your home and there is a large number of available natural ingredients that you already have in your household. You do not have to think about a set of cosmetic products, for which most of us have no money for, but about the proper selection of natural ingredients from which you can make yourself more than a good cream for skin regeneration, which even removes wrinkles and minor scars. Our skin is renewed every day, but sometimes the process is quite slow, then you need just one good homemade face peeling cream, so let’s start with suggestions. To this question there is no single solution nor answer, because the frequency of peeling largely depends on what your skin type is. So if you belong to people who have oily skin, it will be necessary to do it at least three times a week. If on the other hand you have dry skin, then clean your face once a week, or even once every 14 days if your face is extremely sensitive. Each treatment is done very carefully and with mild and gentle circular motion, apply a peeling cream (it is understood that the skin is previously cleaned). Try to avoid the eye area. Recommendation of dermatologists is that after each peeling you gently wash your face with lukewarm water, dry it out, and apply a moisturizer. Why do we need a face peeling? In addition to a variety of creams, lotions, milk and oil to keep skin healthy and nourished it is necessary to regularly use peeling. Specifically, on the surface of the skin every day are accumulating dead cells that need to be removed periodically to encourage regeneration. 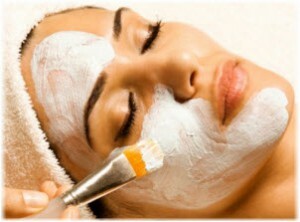 Homemade face peelings prevent clogging of the pores, and aging. However, you should not exaggerate with them in order to avoid irritation, but it is enough to carry out the treatment once or twice a week, except in the case of very oily skin. Natural peels are very easy and quick to prepare, and most of the necessary ingredients you can find in your own household. At the very beginning we will give you an outstanding and easy recipe. Mix 4 tablespoons of corn flour with 3 dl of milk and heat on steam, with constant stirring for about 30 minutes. After that leave it to cool completely, then strain through cheesecloth and mix with a spoon of corn oil and 2-3 drops of essential lavender oil and mix until everything blends. Apply to cleansed face, as well as the neck and chest, in a somewhat thicker layer, however, keep it on the skin until it dries. Then you have to gently massage it in a circular motion and rinse with lukewarm water. This homemade face peeling with corn flour gives visible results. This certainly is not the only recipe that we have prepared for you, we have much more. Mix one-quarter of diced fresh yeast with a small spoon of yogurt and a teaspoon of chamomile tea, then gently mix until a compact homogeneous paste is created. If it is not sufficiently thick, add a little yeast, and in the opposite case add yogurt. Apply on the cleansed face, as well as the cleavage and neck, and leave it to settle and then massage gently in a circular motion. Rinse your face with lukewarm water. Yeast is great for oily skin, and yoghurt and chamomile will further soothe and hydrate. A handful of peeled pumpkin seeds pour in mortar and chop them, then add a tablespoon of cream and ten drops of castor oil. Mix until a fine homogeneous mixture is created. Homemade face peeling should be applied to cleansed skin of the face, chest and neck, and then leave it for at least half an hour. The effects will be much better if you are sufficiently relaxed and you are lying down, and this will prevent leaks. At the end, peeling remove with swab or small cotton swab, and then rinse first with warm, and then cold water. Grind in a blender 25 grams of almonds and mix it with a small spoon of honey, and add two teaspoons of walnut oil and one teaspoon of lemon juice. Mix until a smooth homogeneous mixture is created and then apply it to your hands and gently rub in a circular motion. Leave it on for two to three minutes, and then rinse your face with lukewarm water. Mix half a cup of sea salt with two tablespoons of coconut oil and teaspoon of lavender essential oil. Apply only to clean face, décolleté and neck and leave it to act for at least ten minutes, and then you lightly massage the face. Rinse the area with lukewarm water. Coconut oil is equally effective with dry and mature skin as a face peeling, because it will make the skin much softer and gentler. Mix a tablespoon of honey with two tablespoons of crushed sunflower seeds, 2 tablespoons of cream and the juice of one lemon and a few drops of essential oil of basil. Mix everything until you get a smooth paste, then apply on clean face, décolleté and neck and leave it on for at least ten minutes. Then, gently massage these parts, and wash with lukewarm water. As oatmeal acts as a very mild abrasive, it is also excellent for peeling of extremely sensitive skin. Has a moisturizing and soothing effect. With this recipe a homemade kefir is also used because it has a similar effect as yogurt, which hydrates the skin extremely well, and kefir contains something more beneficial bacteria. Of course, if you do not have this food at hand, you can use plain probiotic yogurt. A handful of finer crushed oatmeal mix with a spoon of kefir to obtain a compact paste. Apply to your face that you have previously cleaned and let it act for fifteen min. Then rub gently in a circular motion and wash with lukewarm water. How to make a natural face peeling with green tea? This tea is widely known for its antioxidant effects, as well as for having an extraordinary rejuvenating effect on the skin. Pour a bag of green tea with boiling water and leave it covered until well cooled. Then mix two tablespoons of tea with two tablespoons of sugar and one tablespoon of honey. Apply on the face, neck and cleavage you previously cleaned and leave it on for longer than ten minutes. Then, gently massage your face with circular motions, and rinse with lukewarm water. What is Roman Face Peeling and how to make one? Roman peeling is prepared with a handful of dried peas that are grind in a blender. When converted into a fine flour, ground peas mix with a cup of milk. Then apply the mixture on your face and let it dry. When fully dried, remove it gently in a circular motion. The remains of the mask remove with lukewarm warm, and then cooler water. To soften dry and hard skin on hands, make the following mixture: tablespoon of lemon juice mix with a teaspoon of sugar and very little water. Apply with gentle circular motion on your hands and let sit on them for about 5 minutes. At the, rinse with lukewarm water. We hope that you learned how to make a face peeling cream at home. In our article we have 10 excellent natural recipes, we are open to your suggestions, and feel free to write your recipes in the comments below, we will gladly publish them on our site.